The community came together on May 29, 2014, to witness the student-led Remember the Forgotten through a flag ceremony, spoken word, student reflections, dance, songs, libation, and a candle ceremony. Remembering the lives and legacy- and advocating for a permanent memorial- together. This is what it means to write the forgotten back into history, our collective history. The ceremony also unveiled the revised NYC Parks signage that finally acknowledges the lives and location of the obliterated graves of the enslaved. View Ms. Melissa Salguero's images from the ceremony. See PIX 11 coverage of the ceremony below. "Remember the Forgotten" was a student performance of dance, music and spoken word to commemorate and honor the lives of the enslaved Africans buried in the now-obliterated Hunts Point Slave Burial Ground -- see attached Press Release. $180,000 worth of capital funding for a memorial, educators and students return to Drake Park to "Remember the Forgotten." 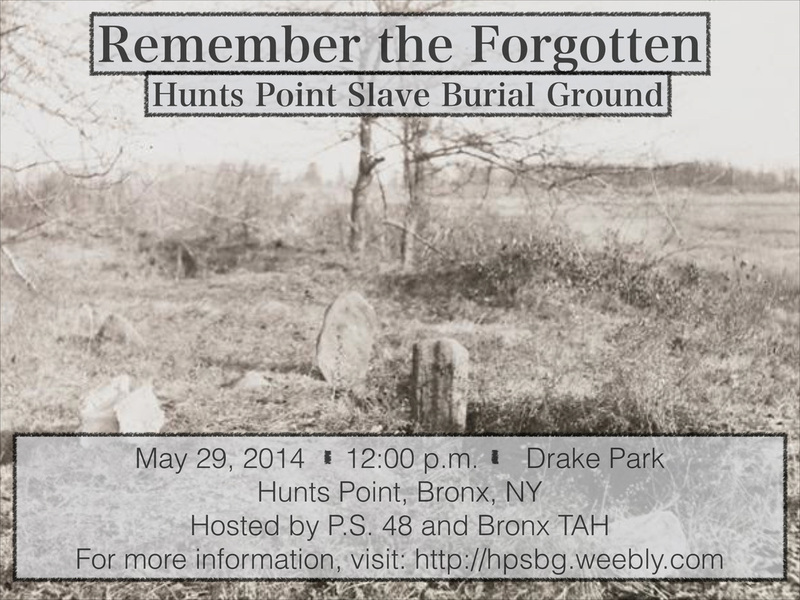 On May 29, 2014, at 12:00 p.m. at Joseph Rodman Drake Park, PS 48 students led a ceremony that finally helped write back into history the dozens of enslaved Africans who toiled for nearly two centuries in the fields and on the estates of Hunts Point.